On the 13th and 14th of May we had the exhibition these were the days all my class had been waiting for, for the last 2 months. In the exhibition I think my group did very well on giving information to other people here in the school and people on the other side of the world, because we gave away allot of our board games and had allot of people sign up for the Antipollution Challenge and the car emission test. Individually I think I did well at advertising our stuff to visitors because I went up to people and asked if they want a board game and said "get it at the car pollution booth". I think we could do better at display the way we showed our work and figuring who does what because sometimes the stand was empty. Click here to see some pictures from the exhibition. In exhibition I have done lots of research made the antipollution challenge sheet and the car emission test sheet and a poster. I need to finish my second poster. I am concerned about the board game. I think people at the exhibition will learn about the effects of car pollution. On Tuesday the 20th of April I had my parent teacher conference, I felt a bit nervous, because I had only practiced once. In the conference I thought I did well I only made one error and my only weakness was that I was very quiet. My parents asked about many things but it was mostly about the exhibition. We agreed that my blog posts were on the short side and that when I have lodes of ideas I tend to talk about my ideas, but this was not a problem. My parents were interested in my language skills and how I have improved in language. After the conference I thought I could work on my blog posts because my blog posts are normally very short and are more like a journal than a reflection, I would achieve this by taking more time on my blog posts and rereading them looking for any mistakes. Click here to go to my PTC blog. Today we had our Unit 7 test, but two days ago we had to do a review sheet. Today we had to choose our favorite part and write a blog post this is my blog post. My favorite part was the final question where we had to find out what the symbols mean, I choose this piece because I thought it was fun. This piece shows that I like to learn in fun ways. My goals for math are to be more organized, to make my work neater and to show more about how I figured the question out. To achieve these goals I will do what I did to make my handwriting neater put my mind to it. A few week ago I reread my portfolio, I was surprised on how much I have improved since the start of the year. I thought I could still do better on my writing. This is my three learner profiles that I made at the beginning of the year they are: Knowledgeable, Caring and risk taker. 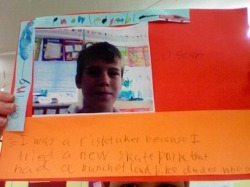 Then we had to write about one of them I choose risk taker this is what I wrote: I was a risk taker because I tried out a new skate park in England. Look below to see my work. On the 28th of march 2010 we had exhibition in this lesson we were working on pages 13 to 16 in our exhibition journal. Then we had to do some research on our topic. I think my group did well on doing pages 13 to 16 in our exhibition journal because we started off behind expectations and we managed to get up to page 16. I think we could have done a bit better on the research part because we sometimes got off topic and did not type a simple enough stuff into google. This is my reflection for the topic 6 assessment. 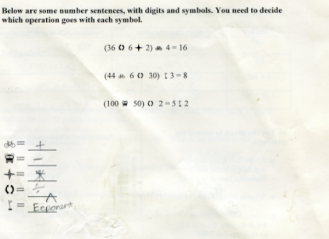 My favourite part was the last page because I thought ahead of the problem by finding the number that if divided by six would equal 24 and got 144 and then all I had to do was make 144. I think that peaceing is one of the biggest problems in four square. Yes it is an easy way to win but then all your opponents have no fun and sometimes get hurt, today Liam smashed me and the ball went into my face. over the years it has happened to many people and that is why I think the peaceing rule should be change, the judges must start calling people out for peaceing and that will stop people from peaceing. Oscar.